Spring training has begun, the pitchers and catchers have reported to Roger Dean Stadium in Jupiter, FL and with that comes the count down to Opening Day’s first pitch. Every year on Opening Day we look forward to who will throw out that first pitch, but how did the tradition of the first pitch get started? It was a moment President Taft made famous in 1910 with his ceremonial first pitch. It was the first by a sitting president and was at a game between the Washington Senators and Philadelphia Athletics. President Taft’s first pitch started a tradition that is celebrated in ballparks all over the country with the first pitch — “the first presidential pitch.” St. Louisans will remember when President Barack Obama threw out the first pitch at the All Star Game at Busch Stadium in 2009. 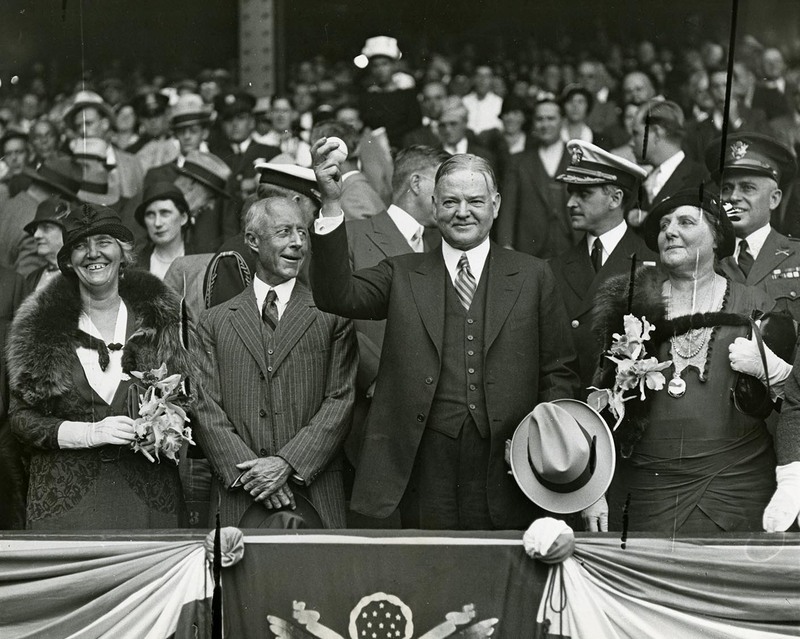 President Herbert Hoover was a big baseball fan and he collected autographed balls, including one signed by Babe Ruth. That ball along with a prestigious collection of balls signed by U.S. Presidents and other world leaders are on display at an exhibit going on right now at the Herbert Hoover Library– just four and a half hours from St. Louis. Whether it’s the First Pitch at a ballgame, a valuable autographed ball or the ball signed and given to a child by a minor league or non-roster player at Spring Training, baseballs have always had a special place in the hearts of fans. These days, autographed baseballs are big business. A quick check of online auctions and memorabilia dealers, found a Yankees Roger Maris signed baseball for $6,000 and a Mickey Mantle New York Yankees autographed baseball for $3,739.95. It’s all about the baseball. There have been stories about fans going to great extremes to snag a ball. Steve Bartman of Chicago became a persona non grata in Chicago after his attempt to catch a ball that went bad. It happened during a play-off game between the Cubs and the Florida Marlins in 2003. It was the eighth inning of Game Six of the NLCS and the Cubs were ahead 3-0 (with a 3 games to 2 lead in the best of seven series). A ball appeared headed out to Cubs leftfielder Moises Alou but Bartman – a lifetime Cubs fan—saw the ball coming towards him and tried to catch it, tipping it and sending it out of Alou’s reach. When the Cubs ended up tanking that series, much of the blame went back to Bartman. Then there are the “important” or “famous” balls caught and what happens to them. Some fans keep them, some sell them, and one even gave it back. One of the most famous was Phil Ozersky who caught Mark McGwire’s 70th Home Run Ball, and while Tim Forneras who caught 61 gave it to the slugger, Ozersky auctioned his off for $2.7 million. Ozersky used some of the money to help his family and donated much to charity. But what about the guy who bought the ball? At the time Todd McFarlane bought it he had plans to exhibit it around the country with any proceeds made going to charity. There are many people who collect autographed baseballs.— but not many people with a collection like one that is on display in a small town in Iowa, at the Herbert Hoover Presidential Museum. 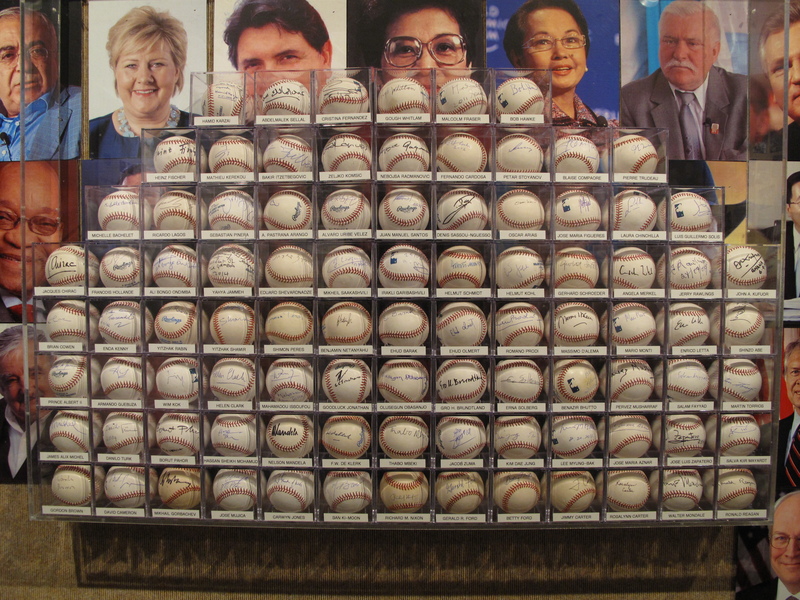 The exhibit features over 180 signed baseballs from leaders, both past and present, from all over the globe, including the late South African President Nelson Mandela, former leaders Mikhail Gorbachev and Margaret Thatcher as well as the nation’s sitting President Barack Obama. 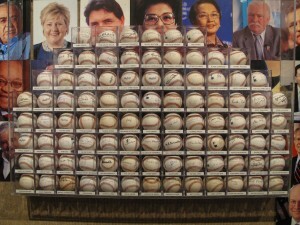 Kaplan, who is a governmental affairs specialist in New York, has been collecting signed baseballs from world leaders and heads of state since 1996 when then President Bill Clinton signed a baseball for him at a meeting in Washington, D.C.
A portion of Kaplan’s collection has been displayed at several presidential library-museums: the Richard Nixon Presidential Library and Museum in Yorba Linda, California, the William Jefferson Clinton Presidential Library and Museum in Little Rock, Arkansas, the Gerald R. Ford Presidential Library and Museum in Grand Rapids, Michigan and the Lyndon B. Johnson Presidential Library and Museum in Austin, Texas. In honor of Herbert Hoover’s love for baseball, the exhibit will also showcase baseball memorabilia from the Hoover collection, including tickets, medals, and baseballs. The Babe Ruth ball will be on display, along with another singular ball signed by Herbert Hoover and the New York Yankees. Another component of The Signature of Baseball will be the history of the Cedar Rapids Kernels. Included will be a timeline of the Kernels history, and items from local legends such as Beldon Hill, Mike Chartak, Art Pennington and others. An interactive feature of the exhibit will be a simulated baseball field, where visitors will learn about the history of the game! The Signature of Baseball will be on display at the Herbert Hoover Presidential Library-Museum until March 22, 2015. The Museum is located in West Branch, Iowa. From St. Louis, you can get there via US-61 N and US-218 N . It is about 280 miles away. Once you get there, it is ¼ mile off I-80 at Exit 254 (located 41 miles west of Davenport or 9 miles east of Iowa City)) and open daily from 9 am – 5 pm. Check out TravelIowa.com to get all the information needed to put together a baseball themed weekend before the Red Birds fly home for their home opener.